Hello! It is the first Thursday of the month again – this time I wasn’t quite so surprised, but it’s still come around ridiculously fast, no? As you’ll have picked up by now, today’s the day of the month where a bunch of us post about glorious, marvellous, never-get-bored-of-them hand-knitted socks. You can knit one sock a year or five pairs a month and you’re very welcome either way – check out Paula’s blog for more info, but the short version is that you post on the first Thursday of the month, link to Paula’s blog post and also link to this clever collected-link page doodah. That’s it! Welcome to the club. I have lots of Thoughts about socks this month. First off, here’s my progress on that dainty little cabled number I posted about last time. Isn’t she lovely? I think this pattern’s going to be called Afternoon Tea (after inspiration from Katherine and other friends on Instagram). The broken rib means that it’s easy to knit, the cables add a little bit of interest, and they all tie in to show off all the beauty of this speckled yarn. It’s important to wear an elegant pair of socks when you’re having afternoon tea, right? There’s a secret smaller cable running all the way down the back of the leg and the heel, too. Secondly – I’m feeling all glowy about my friends in relation to sock-knitting right now (often the case, but especially so today). Some of you have bought my patterns and every time you do I am SO incredibly touched. Thank you thank you! Please know that I notice each and every time, and I don’t think I’ll ever stop being thrilled. (Every single purchase is a thrill to me, but even more so when I know it’s a pal who is parting with actual cold hard cash – you’re all lovely.) And then seeing you actually knitting them – ahhhh, it’s too good! Heart-eyes emojis all-round. In additional friend-appreciation I need to give a promo to the totally ace Katherine from Fiber and Sustenance, who has been helping me by tech-editing all my patterns to date (all while FINISHING HER PHD, to boot) – thank you so much, lovely! 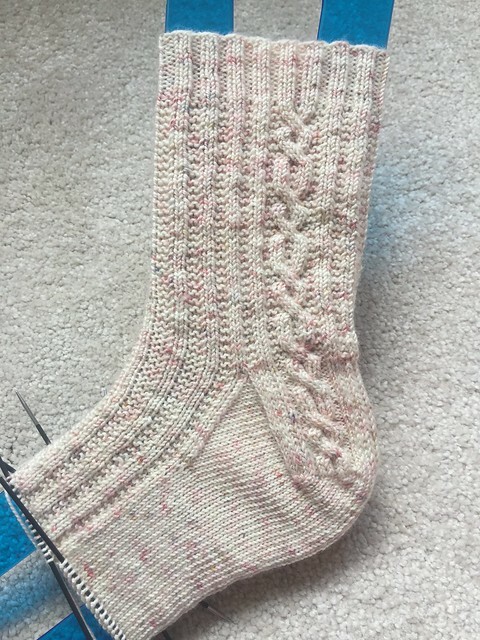 Thirdly, the Afternoon Tea socks above were my travel project of choice during the Great London Yarn Crawl on Saturday, and I can’t post here without giving it a shout-out – best day ever! It was the most excellent reminder of how much my life benefits from knitting in so many ways – I got to spend the day with brilliant old friends (hello Meg! ), lovely ones made on yarn crawls past and who I’ve kept in touch with, and excellently fun brand-new ones. Never a moment where we didn’t have something to natter about, never a point (even for this introvert) where things were awkward or tiring (despite walking 6 miles over the course of the day), lots of lovely shops, gorgeous sunshine, and time spent on public transport with 10 other people knitting and not giving a damn. As seems to have become the norm with my GLYC experiences I didn’t actually buy any yarn on the day, but I did get my hands on some excellent items – a beautiful elm hand-turned bowl from Tribe Yarns which is secretly magnetic (stylish AND functional! 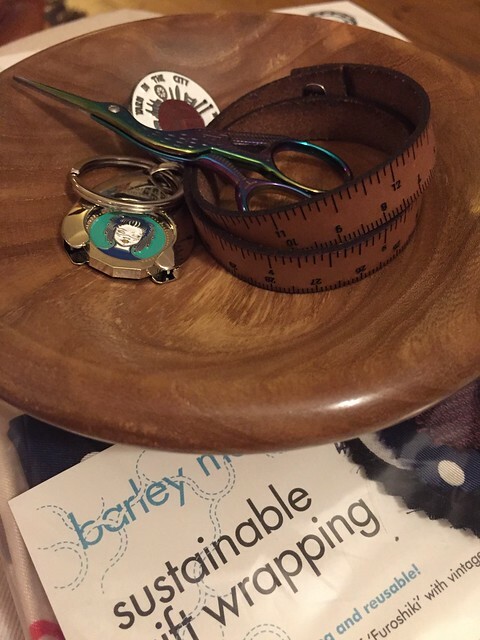 ), a leather ruler wrist-bangle from The Slow Wardrobe (functional AND stylish! ), more scarves from Fabrications for wrapping gifts (stylish AND, oh you get the idea), and a teeny tiny pair of stork scissors from Stag and Bow. Plus an overflowing bowl of happy memories (my Instagram tells the story better than me). And lastly, still in sock news, the tiniest of reminders that the launch sale for Swirls and Stripes ends this Saturday, so if you’re thinking about getting the pattern and want to receive 20% off the usual price, now is the time to click ‘buy it now’. 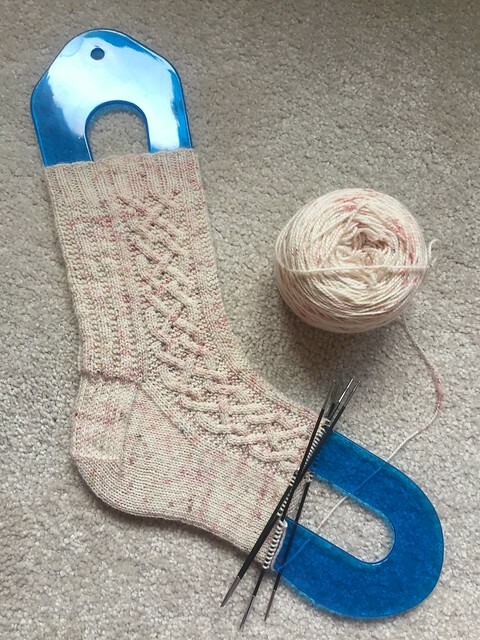 Next Post Once upon a sock in November 2018 – yikes! It was so lovely to see you! I really can’t remember the last time, I think it was the last book swap! Those cable socks are just ❤️ – I’m going to have to up my sock knitting speed to fit these all in! I know, it has definitely been years but I’m not sure how many! And 😀 re the socks, I’m so glad you like them. Yegads, girlfriend! How in the world do you get so much sock knitting in? And writing all these patterns too? I wish I could peek into your mind to see your process 😀 Those cables are so gorgeous and I adore the name of the pattern. You are very welcome for purchasing the patterns; however I will tell you that if I didn’t love the final product, I wouldn’t buy them (unless I thought they were above my skill level) 🙂 So, kudos to you for producing such gorgeous patterns! What a fun change from the usual cable knitting where it’s stockinette and reverse where the cable is.